The topic describes the layout templates and how these templates can be managed in SQL Enlight. A layout template is a set of layout rules that can be stored and later reused. Each layout template is stored in a separate configuration file. The layout template configuration file name is used to identify the template when it is registered in SQL Enlight. Existing layout templates can be exported or imported in SQL Enlight, or new templates can be created. The active layout template is the layout template that holds the current layout rules. Changing the layout rules at the layout rules tab will affect only the active layout template. To change the active layout template, use the Quick Templates List or select a template from the Registered Templates list, start editing it, check the Make this template the active layout template and save the changes. The active template appears bold in the Registered Templates list. The Quick Templates List is a dropdown list that can be found on the SQL Enlight Toolbar.Using the Quick Templates List you can fast switch the active template to another one and reformat your SQL code with the rules of new template. To change the layout setting of a layout template, it first have to be set as active template and then just then its rules can be modified. Applying SQL Enlight settings will flush changes of the active template to its source file. The only property that can be changed without making a template active is its Description, which can be edited and updated when the template is selected in the Registered Templates list. The New,Import,Remove and Export buttons on the right of the Registered Templates list can be used to register or unregister layout templates. Deleting a layout template will unregister the template from SQL Enlight, and it will be no more available in the Registered Templates list. 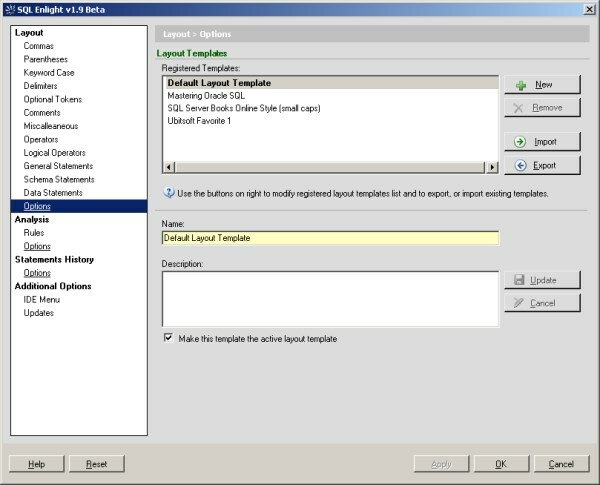 If the template named Default Layout Template is deleted,the next time the SQL Enlight is started a template with the same name will be recreated containing no active layout rules. Reset button appears at the bottom-left corner of the Options dialog.Using the Reset button will discard all changes to the active layout template since the last save.